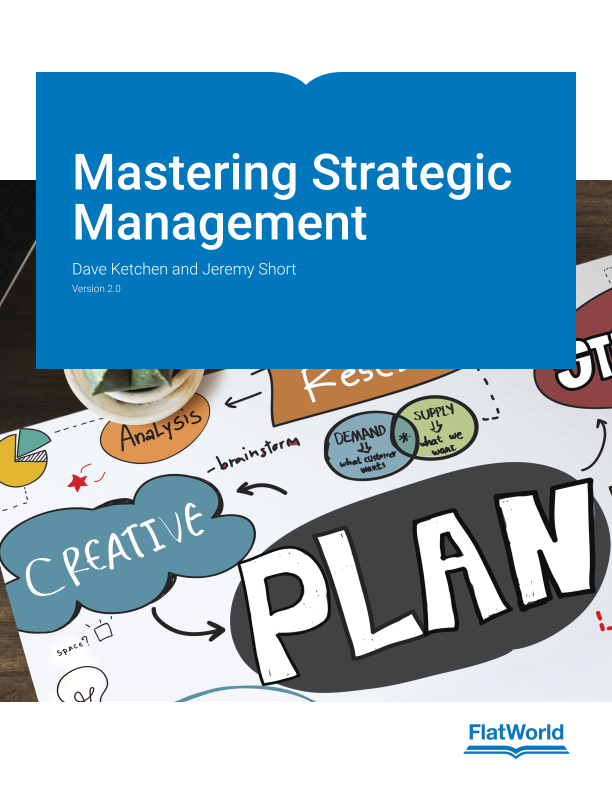 Ketchen and Short’s Mastering Strategic Management draws on insights from various functional subject matters such as marketing, finance, and accounting to demonstrate how top executives make the strategic decisions that drive whether an organization succeeds or fails. Students are encouraged to engage with the material and concepts through graphic displays, illustrative examples, and unique motion-picture links. This edition has been updated to include fresh cases and examples that have been reviewed by the authors and other leading academics to ensure that students have the most current and relevant knowledge. Updated cases and fresh examples. New “Research Roundups” and “Small Business Spotlights” included in each chapter. “Top-Shelf Reading” included in each chapter to enhance and expand the subject matter explored in the text. Visual adaptations of key concepts. Real-world examples from well-known corporations, such as Apple. “Strategy at the Movies” features that link to popular motion-picture examples. 10.3 Understanding Thought Patterns: A Key To Corporate Leadership? Dave Ketchen serves as Lowder Eminent Scholar and Professor of Management at Auburn University. An award-winning educator, Ketchen has taught Strategic Management, Principles of Management, and Franchising. His research interests include strategic management, entrepreneurship, research methods, and strategic supply-chain management. He has published more than one hundred thirty articles in journals such as Administrative Science Quarterly, Academy of Management Journal, and Strategic Management Journal. He has served on thirteen editorial boards, including those of Academy of Management Review, Strategic Management Journal, and Journal of Management Studies. He has served as associate editor for seven journals, including Academy of Management Journal, Journal of International Business Studies, and Organizational Research Methods. Ketchen serves on the teaching team for the Entrepreneurship Bootcamp for Veterans with Disabilities at Florida State University, has acted as an expert witness, and has assisted a variety of private and public sector entities with strategic planning. He is the former chair of the board of directors for the Alabama Launchpad (a statewide business plan competition) and served on the Steering Committee for the Michelin Development–East Alabama (an entity that provided low-interest loans to fuel job creation). Jeremy Short is the Rath Chair in Strategic Management at the University of Oklahoma. His award-winning teaching includes classes such as Principles of Management, Strategic Management, Entrepreneurship, and Management History. Short's research focuses on the determinants of firm and organizational performance. He has published more than fifty articles in such journals as Strategic Management Journal, Organization Science, Personnel Psychology, Organizational Behavior and Human Decision Processes, Academy of Management Learning and Education, and Journal of Management Education, among others. He is an associate editor for the Journal of Management and serves on the editorial board of Organizational Research Methods. He also coauthored the first Harvard Business School case in graphic novel format.